The A.C.E. (Accepting the Challenge of Excellence) Award recognizes high school students who have had to overcome great physical, emotional, or social obstacles and are now eligible for high school graduation. This program especially recognizes students who have made a dramatic change in their attitude and performance during their high school years. These changes have enabled the students to overcome adversities and prepare for graduation. Clubs may also submit their top A.C.E. Award winner to the district competition. Local winners receive a stipens & plaque and at the district level receive $1500 with the opportunity to compete for the $10,000 National A.C.E. Award. Click here for Salem’s A.C.E winners. Typically in Salem & Keizer the committees rely most on the school guidance counselors to assist in locating prospective candidates. Manages the program throughout the duration of the project, which usually coincides with the nine-month school year. Obtain permission, cooperation and endorsement of the institutions or groups from which the A.C.E. Award monthly winners will be selected. Determine specific eligibility criteria for nominations. Any young person who has faced and overcome special challenges in life can be eligible for your the A.C.E. Award. Club members are informed about the nominees, as well as all of the rules and regulations of the program. Determine the type of award(s) to be presented. A committee chairperson is to see that final preparations for the award are made, including engraving and printing requirements. Many times it is appropriate to present an honoree with a monetary gift, designated for future education, in the form of a savings bond or scholarship. Or, a suitable plaque or certificate is also acceptable. Special A.C.E. Award plaques and certificates are available from your National Headquarters Supply Department. Plan all the details of the award presentation, including who will make the presentation, what guests will be invited and the type of program. Work closely with the club’s public relations committee to ensure maximum publicity. Obtain photographs of the winners and supply them to the media with a news release. The type of award and method of recognition is solely up to the club, as is the number of awards given during the year. Clubs may begin a yearly competition and award a scholarship or bond to the annual winner. This can be done through filling out the A.C.E. Award application available from National Headquarters. The club may award one winner a month with each winner receiving a calculator or other educational aid which will help him or her with further studies. At the end of the year, the monthly winners can compete in an essay, speech or other competition with the winner receiving a bond in an amount which your club can afford. To offset the cost of the awards, there is great potential for outside underwriting with local businesses. Clubs may also obtain the names of deserving students from one of their sources and recognize them at a meeting with a plaque and certificate. After a club has chosen its top A.C.E. Award winner, the honoree’s name and qualifications is submitted to the NWdistrict for the district A.C.E. Award competition. The district appoints an A.C.E. Award chairperson. It is this person’s responsibility to set a deadline for all entries and make sure that clubs are informed of this deadline. During the district’s annual convention, a special ceremony/banquet is organized to honor the A.C.E. Award winner. The NW district’s A.C.E. Award winner then becomes eligible to compete with honorees from all districts in Exchange for the title of National A.C.E. Award winner. Each district may nominate two candidates (opposite genders) who live within the district. Candidates must be qualified to graduate from public, parochial or private schools, and must have been selected as an A.C.E. Award winner on both club and district levels. Entry deadline for A.C.E. Award winner candidates is June 1. Each entry must be returned on an official entry form accompanied by the essays and a 5 X 7 photo. The entry must be signed by the district president, parents/guardian, and school official. The National Exchange Club will present an award and a $10,000 scholarship to the A.C.E award recipient. The first $5,000 will be presented at the Youth Recognition Luncheon at the National Convention. The second $5,000 installment will be paid in full to the student’s school of choice at the time of registration of his or her sophomore year. In addition, the student will be recognized in Exchange’s national magazine, Exchange Today. 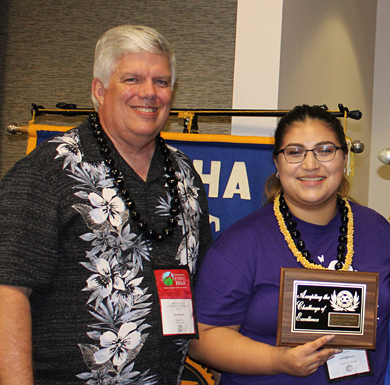 As guests of the National Exchange Club, the award recipient and up to two adult chaperons (parents or official guardians) will enjoy the highlights of the National Convention, during which the award will be presented. The National Exchange Club will give a convention package, including airfare and hotel to the honoree and his/her two chaperons. The objective of our A.C.E Award project is to give public recognition to young people for their accomplishments. Offering them a little more recognition with a publicity campaign aimed at the local media. To accomplish this we send news releases to area television, radio stations, newspapers and student publications. The news release covers who was selected as the monthly A.C.E. Award winner, some of his/her achievements and where and when the event is going to take place. The release also contains a brief paragraph explaining the A.C.E. Award program. Highlighting the human interest perspective. Note: Candidate must be able to accept the award in person at the scheduled event at the National Convention in order to win. Call National Headquarters or visit our website for the current year’s dates & times, 800-XCHANGE (924-2643), ext. 123, and verify with candidate before submitting entry form to National. This requirement also applies to the National Youth of the Year Award.